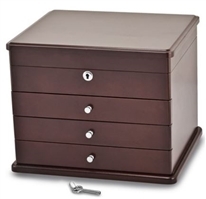 Keep your most valuable jewelry items secure in the top section of a partially lockable jewelry box. The top storage are under the lid is locked for added security while the swing out sides or drawers do not lock. This allows you to keep your most valuable jewelry locked while still giving you convenient access to your favorite jewelry pieces that you love to wear often. Our jewelry boxes that lock partially are available in leather or wooden finishes and are styled in both chest and armoire designs. 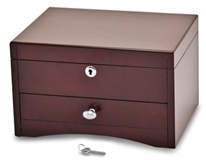 Partially locking jewelry boxes usually have a lockable top section only. If you have questions, or would like assistance selecting the perfect lockable jewelry box, give us a call or send us an email - we're here to help and are happy to answer any questions you may have. 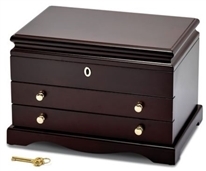 All our partially lockable jewelry boxes qualify for easy 30 day returns and 1 year product warranties.